Quince (Cydonia oblonga): growing, planting, caring. A fruit-bearing tree, also grown for its attractive pale pink blossoms. Full description for Cydonia oblonga not yet available. Small deciduous tree, 5 to 8 m high and 4 to 6 m wide, with tomentose young twigs, alternate leaves, simple, and five-petalled white-pink flowers. This description concerns Cydonia oblonga - the quince that gives fruits! This genus was formerly composed of four other species now divided into two other genera: Pseudocydonia - which includes the Chinese quince, pseudocydonia sinensis - and Chaenomeles. 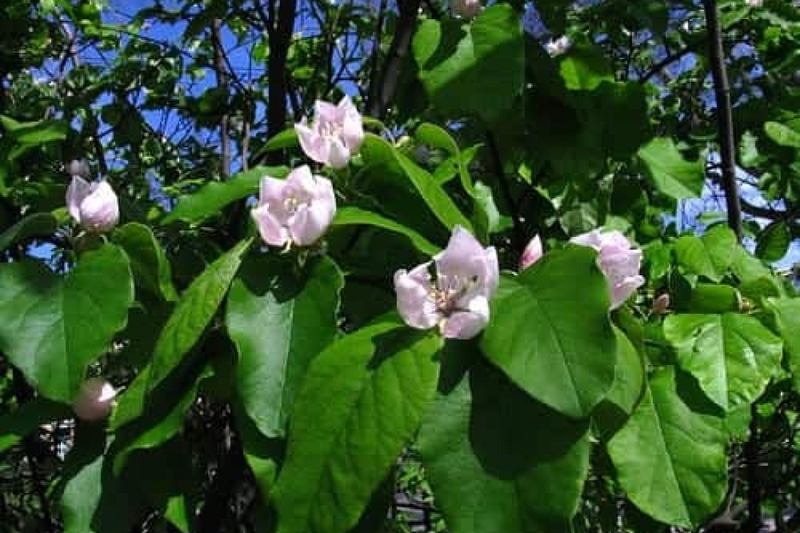 The quince is ok with most kind of soil, but will give more fruits in slightly acidic soil, and appreciates the sheltered and sunny situations. It will fare better in hot weather, but supports almost all latitudes. Before planting, trim damaged roots and branches to balance root volume and foliage volume. Plant in a hole at least twice as big as the root ball. Soaking roots before planting will greatly improve the chances of recovery. Be careful not to bury the base of the stems. Form a hollow around the plant, which will be used for watering during the first months. Tamp the soil - do not hesitate to use all the weight of the body! Finally water until filling the hollow you shaped, at least two watering cans! Prune in winter, if necessary. The first three or four years, prune to establish a framework of fruiting branches. Thereafter, you will intervene only to eliminate shoots misplaced or excessive. Also remove the dead wood. On trellised quince trees, reduce the shoots of the previous year by two-thirds of their length. Cut preferably over a fruit bud (well rounded) which forms mainly at the base of young twigs. Mulch with compost or well decomposed manure in the fall, and with what you'll have on hand in the spring - dry grass clippings do the trick! Collect the quince as late as possible because they no longer ripe when separated from the tree. However, proceed before the first frost! It is sometimes expected that the fruits fall by themselves, but this weakens them and reduces their conservation time. Do not be surprised the first year: even ripe, the quince is hard! You can keep them for two or three months in a dark and cool place. Control moisture - at the risk of rotting fruit! - and isolate them from all the other fruits to which they are likely to transmit their pronounced aroma!